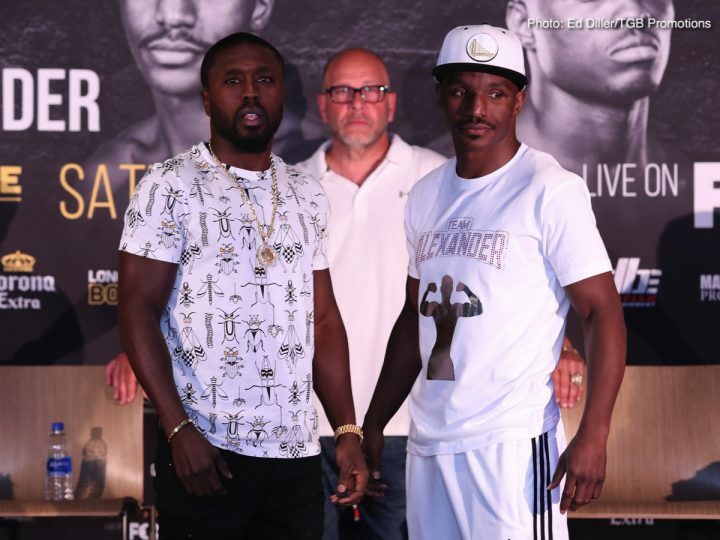 By Dan Ambrose: An interesting fight between former 147 pound world champions Andre Berto and Devon Alexander will be fighting in a crossroads match this Saturday night in the main event along with former WBO middleweight champion Peter Quillin against J’Leon Love. Those fights will be televised on Premier Boxing Champions on Fox from the Nassau Coliseum in Uniondale, New York. The winner of the Berto-Alexander fight will likely be getting a world title shot. The loser will need to decide whether they want to continue his career. This is an important clash between the 34-year-old former IBF/WBC welterweight champion Berto and 31-year-old former two division world champion Alexander, as the winner of the fight is expected to get a title shot against IBF 147-pound champion Errol Spence Jr. in 2019. Berto (31-5, 24 KOs) and Alexander (27-4-1, 14 KOs) were two of the best welterweights in the division eight years ago, but they’ve aged and been replaced by younger fighters with skill, size and punching power. At this point in Berto and Alexander’s careers, they’re still in the middle of the pack in the 147 pound division, but they’re not top three guys. One of the things that have hurt the careers of Berto and Alexander is the inactivity that they’ve had. The two fighters haven’t stayed busy. Berto has fought only two times in the last three years in losing to Shawn Porter and beating Victor Ortiz. The 31-year-old Alexander has fought only three times since 2015 in being held to a 12 round draw in his last fight against Victor Ortiz, beating Walter Castillo before that and then losing to journeyman Aaron Martinez by a 10 round unanimous decision. The no longer relevant Victor Ortiz was used as an opponent for Both Berto and Alexander. Instead of them facing a relevant guy in his prime, Alexander and Berto were matched against Ortiz in what gave the appearance of old timer’s fights. Alexander vs. Berto is also largely viewed as a fight between two shot fighters that have seen their best come and go 3,000 yesterday’s ago. Berto’s record in his last seven fights is something awful in going three wins and four losses. He’s beaten the lower level fighters Victor Ortiz, Josesito Lopez and Steve Upsher Chambers, but lost to the better guys Floyd Mayweather Jr., Shawn Porter, Robert Guerrero and Jesus Soto Karass. It was a minor miracle that Berto was given a fight against Mayweather in 2015, because there were arguably much more talented fighters available for him to fight at the time like Keith Thurman, Shawn Porter, Amir Khan, Kell Brook and Errol Spence. Mayweather handpicked Berto in what was said to be his last fight of his career. As it turned out, Mayweather chose to come back in 2017 against UFC fighter Conor McGregor. Still, Berto is Mayweather’s last true opponent of his career from a boxing background. Berto is coming off of a 9th round stoppage loss to Porter in a WBC welterweight title eliminator last year in April. Devon Alexander’s record in the last five years of his career isn’t any better than Berto’s. Since 2013, Alexander has won three fights, lost four and fought to a draw in another. His record is 2-3-1 in his last six fights, which obviously isn’t good. Alexander fought well enough to deserve a victory in his last fight against Victor Ortiz last February. The fight was ruled a draw, but Alexander looked like the winner. Alexander did fade in the second half somewhat, which obviously influenced the judges’ scoring of the contest. Alexander still looked like he’d done enough to deserve the ‘W’ in the fight. April. Porter head-butted Berto a number of times in the fight, and it seemed to throw off his game. Berto wasn’t able to deal with the rough stuff from Porter in an effective manner. Berto has a good chance of beating Alexander if he can put in the kind of performance he did in stopping Victor Ortiz in the 4th round in April 2016. However, Berto won’t win if he looks like he did in his last fight against Porter last year. Berto is going to need to come better than that for him to have a shot at beating the still young 31-year-old Alexander. It doesn’t help Berto’s case that he’s coming off of a 16 month layoff since his last fight against Porter. Before that match, Berto had been out of the ring for 12 months after stopping Victor Ortiz in round 4 in April 2016. You have to suspect that Berto’s love or boxing has waned in the last four years of his career because his inactivity suggests that his mind is elsewhere. Even if Berto beats Alexander to earn himself a title shot against Spence, it’s highly unlikely he’ll win that fight. The Spence fight will be little more than a payday bout for the Berto-Alexander winner. Neither guy has the kind of talent that will give them much of a chance against a young lion like Spence. Berto has been fragile in the last seven years of his career, suffering biceps injuries and cuts. He was completely over-matched in his last fight against Porter in getting dropped three times in the contest. It looked like Berto’s mind wasn’t into the fight the way he needed for him to have a chance of overcoming the youth advantage of Porter. In the chief support on the Berto vs. Alexander card, 35-year-old former World Boxing Organization 160-pound champion Peter ‘Kid Chocolate’ Quillin (33-1-1, 23 KOs) will be facing face J’Leon Love (24-1-1, 13 KOs) in a 10 round fight in the 168-pound weight class. Quillin hurt his own career when he decided to vacate his WBO middleweight title four years ago in September 2014 in order to swerve around his mandatory challenger Matt Korobov at the time. Quillin then took a year off from boxing and didn’t return until he faces Andy Lee in April 2015. Their fight was scored a 12 round draw. Unfortunately for Quillin, his career has never regained the momentum that it once had before he made the decision to vacate his WBO 160lb title and sit outside the ring for a year. In Quillin’s only three fights since 2015, he’s beaten Michael Zerafa, lost to Daniel Jacobs by a 1st round knockout and defeated journeyman Dashon Johnson last September. If Quillin loses to Love, then he needs to think about retiring. Quillin is 35-years-old and he’s still not fought a high quality super middleweight since moving up to the weight class. Also on the card is former IBF light welterweight champion Sergey Lipinets (13-1, 10 Kos) fighting Erick Bone (20-5, 8 KOs).